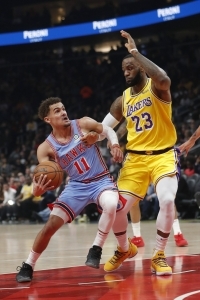 ATLANTA (AP) — Trae Young knew he’d have to carry a heavy load, and that was OK with him. The Lakers dropped 2½ games behind Sacramento for the final playoff spot in the Western Conference. The Lakers were without center Tyson Chandler, who was sidelined by a toe injury. Mike Muscala dressed despite a sprained right ankle, but didn’t play against his former team. Follow Paul Newberry on TWITTER. His work can be found at AP NEWS HERE.